First of all, we want to welcome you as one of the newest member-owners of GVEC! We hope you find that your experience here with our people, products, and services surpass your need and expectations. Below, we’ve compiled a list of important items to review so you can start saving time and money with us! Understand your Cooperative and benefits. With this unique form of business, comes an array of member benefits to look forward to. Learn more about us, our roots, who we are today, and opportunities for establishing a long and prosperous career with GVEC. If you work with a nonprofit organization or school, civic club, community event, or know/have a senior in high school – these services will benefit you. 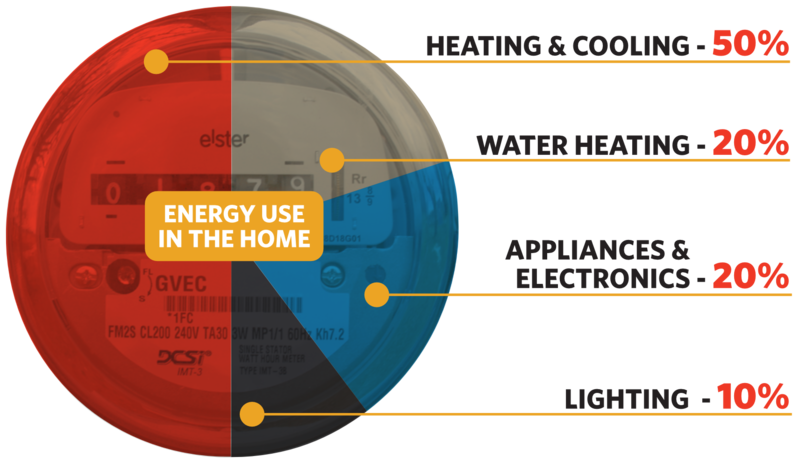 Understand what goes into your electric bill each month and how it is calculated. This will take the guesswork out of future bills. Know that bills will fluctuate each month based on many factors around on your lifestyle, however one of the largest factors is weather. Bills are typically highest in the cold winter and hot summer months. We have energy efficiency advice, products, and services to help. Learn how to report and track electric outages, and electrical safety tips. Learn about our outage reporting texting service – TextPower. It’s the easiest way to report outages. With this option, you’ll receive updates on the status of your outage and when it is restored. Track outages any time with our outage viewer. See the safety section of our website to learn more about outage and electrical safety. Set yourself up on SmartHub – our electric bill pay and account management system. Create a login for our bill pay and account management system, SmartHub. You can access it via computer at www.gvec.org or download the free smartphone app called Smarthub. Connect with us for your Internet needs. Since you have a new place, inquire with us on your needs for Internet. We offer Fiber Power®, the fastest Internet technology on the market today in select areas, and wireless service in the more rural areas. Identify ways to save money with our energy efficiency services. Call a Member Services Advisor at any time for a complimentary energy audit for your home or business. We’ll show you where the money wasters are and offer unbiased advice on efficient options that fit your goals and budget. Review our Energy Efficiency Rebate Program. We offer cash back on new home construction, home renovations, and renewable alternatives that meet our guidelines for efficiency. As a bonus, when you shop GVEC Home for applicable products, your rebate is instant, no waiting for reimbursement! Follow us on Facebook, Twitter, LinkedIn and Instagram: Get major outage updates, efficiency tips, job postings, and more! Read Texas Co-Op Power magazine or our GVEC Blog – Each member receives a copy of The GVEC Review within Texas Co-Op Power magazine each month at your home or business. You’ll find updates such as rate changes and energy efficiency information, programs, services, appliance sales, industry and Cooperative news, community organizations and events, recipes, and more! You’ll also see stories and more posted on our blog. Attend your District Meeting and the Annual Meeting each year.